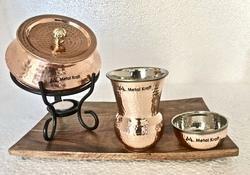 Metal Kraft brings another range of Unique Table Service Items that are just meant for Desi Dhaba or Desi Cafe. It's a totally different range of Tableware which has new imaginations, art & creativity. Restaurants like Molecule, Firangi, Imly, Backyard, Junkyard, Submarine, Too Indian, Desi Dhabas & Cafe's have used them effectively using the artwork done creatively by their Chefs to prepare & present world class food & beverage serving dishes. 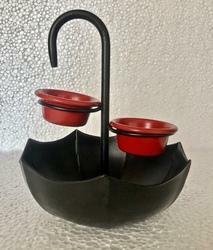 We offer a uniquely designed Inverted Umbrella Dish in which the Inverted part of Umbrella can hold any food item ranging from Snacks to Biryanis. The Stick Holds Chutney Bowl to compliment it with snacks. 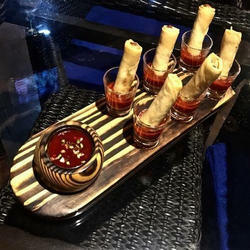 We offer our stylised range of Snack Service Set & these days Tacos has become a hot snack service dish. To present it in style we offer Tacos Snack Service Set. 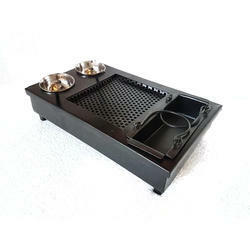 1 Black Snack Service Tray 13.5" x 7.5"
Size 8" x 5" x 7"
We offer unique way to serve Tikka & Kebabs by combining Stainless Steel with Wood. 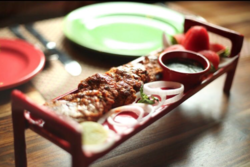 With Kebabs on the arrow, they looks of dish looks so much tempting & mouth watering that surely it comes a diner's delight having these served on tables. We offer unique way to serve piping hot snacks like Tikka & Kebabs on Talwar or Sword. 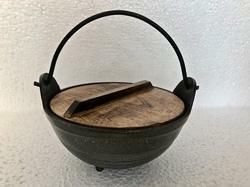 The Sword has a Bowl undernear to house charcoal for further warming the snacks. The steaming hot snacks served on the table by the steward gives a very priviledged & awesome dining experience to the diner. The Sword can stay upright on the table as it has a solid support base. Length of the Sword: 24"
The same Teflon Karahi is also available without Warmer to house & serve all hoit veg & non veg curries in style. 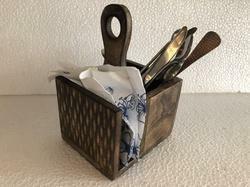 We offer smart way to place Cutlery & Napkins in the form of a Wooden Cutlkery 7 Napkin Holder which on one side houses Tissues & on other side stores cutlery. These kind of Caddies leave good amount of space on the table & makes it look better organized. The handle of top enusres that it can be easily lifted & restored back after replenishing. 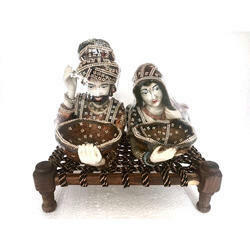 We offer Miniature Manjhi Style Platters which are used to serve Breads, Condiments & creative, imaginative food dishes on it. 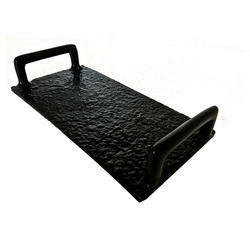 They are offered in different sizes to suit individual's requirements. 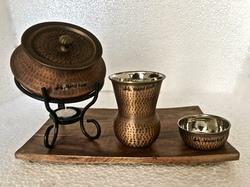 On the same lines we offer Smokey Finished Copper Mutter Kucla/Biryani Platter that just looks amazing in this finish. 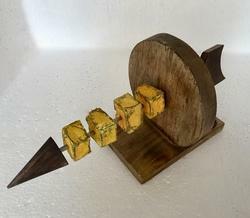 A must for serving Tawa Snacks in Style. 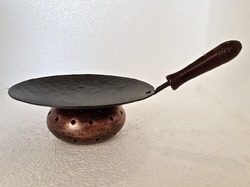 We offer uniquely designed Teflon Tawa with a Belly Perforated Angithi in Smokey Golden Texture. The presentation of Food of Tawa just looks wonderful. One universal size can take any portion size, so whether served half or full one size serves all. Little semi gravy based dishes can also be be served in style on the unit. 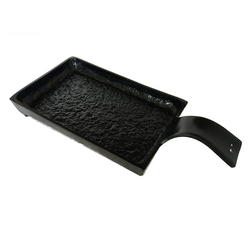 Size 5" x 5" x 4"
To serve piping Hot food in style we offer a unque Teflon Coated Square Dish with Warmer that house one portion of food & any thing from Hot Snacks to Semi gravy or full gravy based dishes can be served in the dish. Dimension 8.5" x 5" x 3"
With the change in serving styles we have set up new range of snack service dishes. 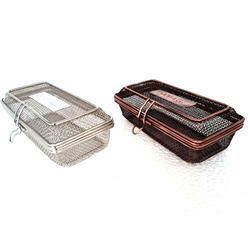 We now offer Silver & Smokey Finished Fryer Boxes which can serve French Fries, Potato Wedges, Burgers, Finh Fingers, Fish Orley, Chicken & Fish Temporas in style. Placing Butter paper inside the dish, it keeps the retain the flavour of food & items remain crispy & yummy. 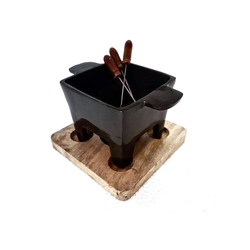 We offer a unique way to serve Snacks Hot on a Black Tikka & & Kebab Snacks Press. 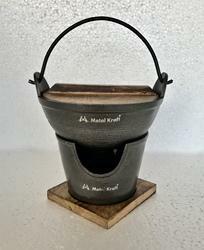 The unit just resembles tradition Indian Charcoal Press. 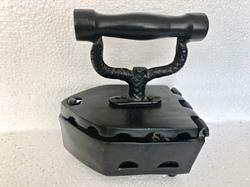 The inside of the press has a charcoal bed above which house a perforated partion that house hot piping snacks just like burning charcoal. To serve all gravy based hot curries in style we offer Teflon Coated Karahi, Balti Dish with warmer. The unit also h wooden base for extra stability. 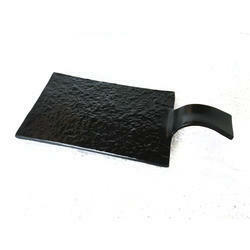 The Karahi onel is also available on request subject to bulk quantity. 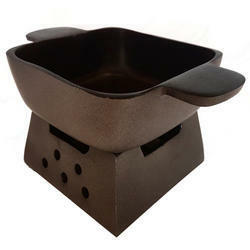 The Dia is 7" & ht with stand is 6"
To serve food in Style we offer Hot & happening range of Tablewares. 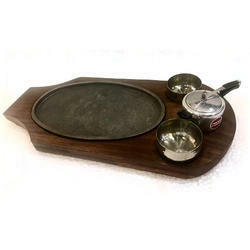 One of the examples of which is this Slate Style Flat which is effectively used to serve Snacks. 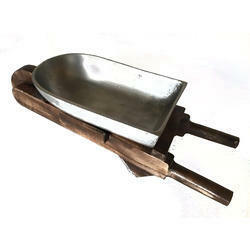 We offer a unique way to serve food in the form of Sizzler clubbed with Chutney Cooker. Our Oblong Sizzler with this combination has become a hot seller among Upcoming Contemporary Restaurants. 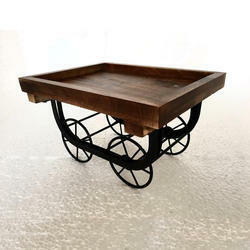 The Rough Rustic feel of Platters is very much in & eyeing on the trend we have developed Black Rustic Look Platter. The Flat Tile Style Platter has a top surface that resemble just like a Tile & two handles on the sizes eases the serving operation. 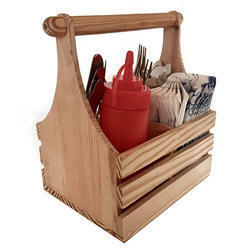 Size (Inches) 8" x 6.5" x 10"
To organize Cutlery, Napkins & Sauces in one go, we offer a unique wooden rack which houses all of them. On any table, these items look stylish & creates more space for other food dishes to be served with ease. We offer unique way to serve snacks whether it's indian or Chinese. One can serve Gol Gappa to Dimsums on stuch wooden platters. This snacks sets which houses Gol Gappa in the picture has a Bamboo Straw made Riser which has a wooden Plate to house Sooka Golgappa. A Borosylicate Beaker 250 ml holds Pani Puri Water, A chutney or aloo chana bowl in wooden & a Disposoable Syringe is used to serve Chatni or a different flavour of Pani Puri Water. The concept looks unique & gives a total different presentation idea of these kind of snacks. Sure it's a diner's delight to get this kind of unmatched service. Platter Size: 15" x 8"
Food Presentation & serving today has reached a totally new level. To serve Snacks like Malai Tikka, Spring Roles, Canapees, Golgappa in style we offer Pine wood Platter which houses 6 Shot Glasses & an additional bowl to serve Extra Water of Golgappa or can serve as Chutney Bowl, nut Bowl when clubbed with snacks. Unique presentation increases the number of orders to manifold. Yet another addition to our popular Pine Wood Food Service Dishes is the Pinewood Rectangular Snack Service Dish with 6 Shot Glasses & Bowl. 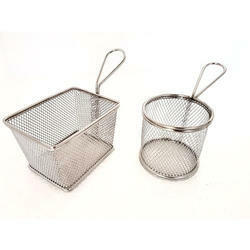 These can be utilised for serving Golgappas or Snacks/Canapees like Spring Roles, Mini Bites of Tikka & Kebabs. The Bowl similarily can either house additional Goldgappa water or Chutneys, Nuts etc. 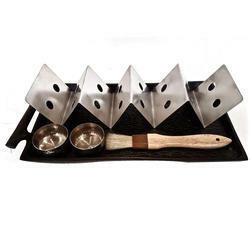 Dimension 12" x 7" x 2"
To serve Snacks in style we offer unique Rect Table service Snacks Set which has in built Chutney Bowls, The Centre Stage has perforated place to hold snacks & where underneath one can place charcoal. The last Rect Dish keeps Onions Salad. 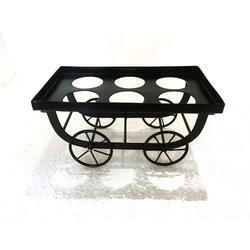 It's a consize way to serve hot snacks in style. To serve Indian Breads in Desi Style we offer a Chaaj Bread Basket which just looks picture perfect on a table. 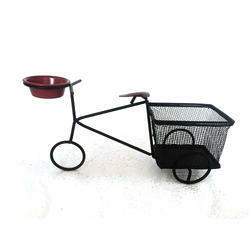 Apart of that Basket can also be used to serve dry snacks on it. Whether it's Potato Wedges, French Fries for Conti food, they form the integral part of side dishes. To serve them in style & contemporary way, we offer Carts to house these snack foods which make them look more presentable & tempting. To present food in style has always been tried & tested by Restaurants, but with growing competion the Restaurant & Caterers think OTB way(Out of the Box) to present food in style, which is one of the reasons that now a days, one finds welcome drinks before the meal & condiments serving after the meal in Restaurant food serving. We present a unique way to serve condiments like Saunf, Sugar Coated Aniseeds, Supari, Flavoured Elaichis, Paans, Candies, Toffies to make the leaving diner feel happy & contented on Gabru Mukhtiar Condiment Dish, which just looks awesome. 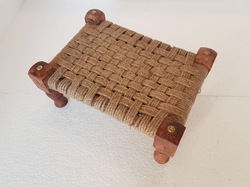 The Set is offer with or without Khaat. We understand how essential Table service is these days & going by the trend offer innovative soltions to serve snacks in style. Out Tandoor Thela is just apt for service Dry Snacks like Tikkas, Kebbas, & all Tandoori stuff. 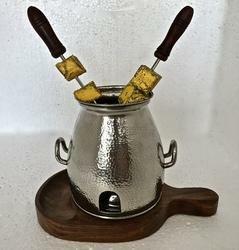 Thela can also be used to serve shot glass drinks. We offer OTB solutions to serve snacks in style. Our latest addition to this unique Bhaba Style Tableware is Tikka & Keba Hammer which we offer in two sizes to suit 1/2 portion & one portion Snacks. 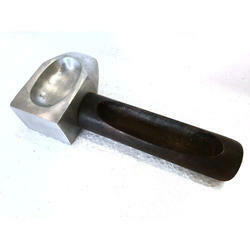 The Handle has a cavity to house Snacks & cavity on the hammer head house Chutney. We offer Desi Style tableware which is just for for Contemporary Food service. 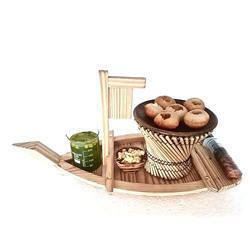 The Char Pai Platter is offer to serve Snacks in style & food laid on top looks attractive. The unique shape of the dish makes it suitable to serve Thai Curry & Pasta. The partition in the dish can also mae it serve Steam Rice or Garlike Braed as sides dishes on teh same cart. The Typical India Thela make it look awesome. Dish Size: 9" x 5.5"
Thela Size: 17" x 6"
To serve semi gravy to thick gravy based dishes & snacks, we offer Shallow Depth Platter for Table Service. Food on Black surface enhances the looks & which makes it look more delicious & mouth watering. These days food presentation & serving has become really important. 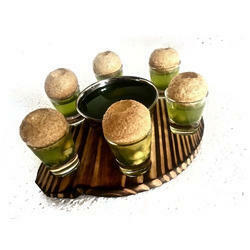 To bring welcome drinks like mini mocktails, paan Syrups or Pani Puri Snack Service, we offer Iron Thela with Shot Glasses. This receipe has become hot favourite of many restaurants these days. With changing dining habits the the food is served & displayed also also seen dynamic change. 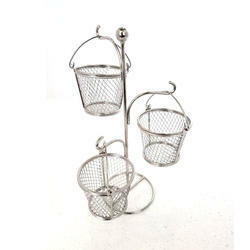 For serving sides like Potato Wedges, French Fries, Chicken Nuggets, Fish or Chicken Fingers, Drumsticks we offer Mini Bites Tree which contains 3 Wire Buckets to house these Mini Snacks. Food presentation becomes very different & unique using these props. We our unique way to serve dishes being it gravy based dishes or dry snacks. 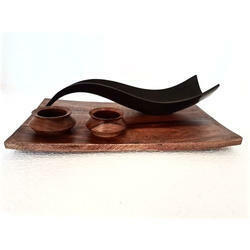 The Wave shape Teflon Coated Platter with Wooden Tray & Handi Chutney or Dip bowls looks awesome when clubbled together. For serving warm food, we our a unique way to serve it in the form of Square Teflon Coated Dish & warmer with Wooden Base which can serve all gravy based dishes in style & piping hot. The looks, style & feel is just amazing & all of it is clubbed together so it eventually occupies minimal space on the table. Size 10" x 7" x 4"
Now a days the condiments serving at the end of dinner has become so popular & so have the ways to serve them. To serve Condiments like Sugar Coated Saunf(Aniseed), Anardana Goli, Aam Papad Pills, Scented Supaari, Gur & all mukhwas items we offer Manjhi with wooden Bowls. They can be clubbled together to give great feel to the food service. 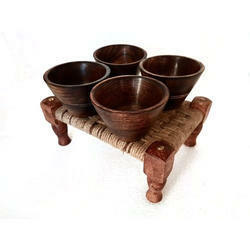 Separaetley Bowls & Manjhi are also also available. 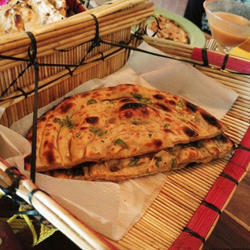 Manjhi alone is extensively used to serve all kinds of Indian breads like Roti, Naan & Paranthas. 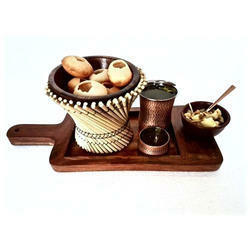 Yet another addition to our highly successful range of SS Hammered Tablewares is Table Service Tandoor. To witness a fine dining experience, our Tandoors are the best bet. Once served on Table, surely the orders will start flowing for more & more starters. We offer these Tandoors with 2 Skewers & the charcoal or T-light underneath which keeps starters like Tikka's & Kebab's warm, as if they are just being served direct from Tandoor. Now a days the old way of service is no more in practice. These days the food service whether it Fries, Breads(Baby Naans, Rotis, Garlic Breads), Slices, Salads, Wedges, Nuggets Fish Finger, Fryer Baskets have replaced them all. The looks become trendy & stylish & enhances the dining decor. Looking for Desi Style Tableware ?